The October Wylie Senior Rec Center Newsletter for adults age 55+ is now available on our City web page. This month we will be savoring the food from Royal Chinese Buffet, enjoying a lighter look into politics at the play "Red Hot Patriot", perusing local art at Edom Arts Festival, marveling at all the State Fair of Texas has to offer, and traveling back to the 1800's at Plano's Heritage Farmstead Museum. Join us at the center for open play games, Zumba Fitness, TechTalk, card making, and more! Question? Contact Senior Rec staff, Recreation@WylieTexas.gov or 972-516-6349. 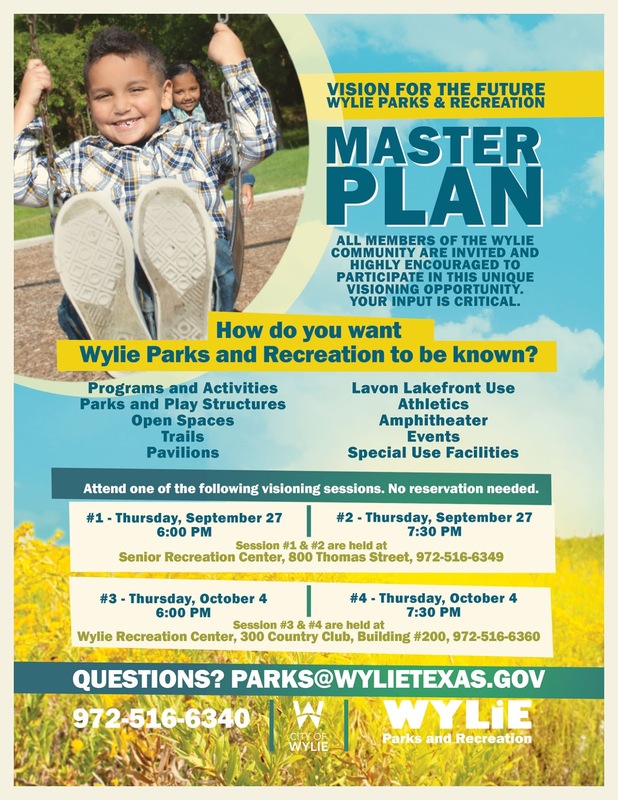 Wylie Parks and Rec Master Plan Sessions Kick-off Next Week! All members of the Wylie community are invited and highly encouraged to participate in this unique visioning opportunity. No reservation required. How do you want Wylie Parks and Recreation to be known? For more information visit, Parks Master Plans. Questions? Contact Parks@WylieTexas.gov, or 972-516-6340.